Be it at TV debates or seminars, the law minister often quotes from a copy of the original manuscript of the Constitution to support his government’s stance. At a time when the BJP is severely under attack from critics for violating the spirit of the Constitution, the founding document of the republic has become the favourite accessory of the worthy law minister of the country. 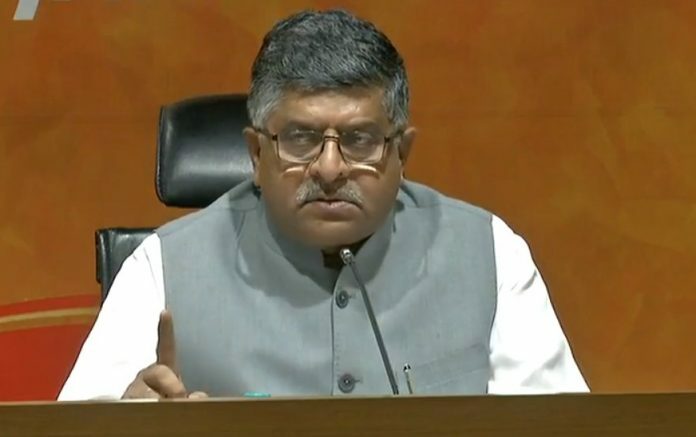 From TV debates to seminars, the copy of the original manuscript of the Constitution has bolstered minister Ravi Shankar Prasad’s arguments and supported his claims like ‘there are photos of Hindu deities in our Constitution’. The copy of the manuscript most recently made an appearance at a special event organised by Aaj Tak Saturday. At an event called ‘Panchayat’, organised by the channel to assess the performance of the Modi government after four years, Prasad, once again, came armed with his copy. While talking about how the BJP was being attacked in Karnataka for not being ‘constitutional’, Prasad pointed to pictures of Hindu deities in his copy of the original manuscript of the Constitution and demonstrated how there was no Aurangzeb or Babur in it. Had the Constitution incorporated such illustrations today, it would have sparked an outcry about “how India is turning saffron”, he said. Prasad often quotes from this copy to support his government’s stance in public appearances. It is his weapon of choice in the battle against the opposition, and to enforce his Hindutva ideology. There are about half a dozen copies of the original manuscript, including one with the union ministry of law and justice. After a row erupted over the removal of the words ‘secular’ and ‘socialist’ from a Republic Day advertisement by the government in January 2015, Prasad had defended the move stating that the terms were added later. He had said that “there is no harm” in debating if the word ‘secular’ should find mention in the Constitution. In January 2017, addressing a seminar at the India International Centre, Prasad had passed around the copy of the original manuscript among other participants and said, “Atop the page on fundamental rights, we have a visual of Rama, Sita and Lakshmana returning to Ayodhya after the battle in Lanka”. Later that year, in April, Prasad referenced the same images after the opposition criticised the BJP for not respecting the ideals of secularism. He praised the country’s founding fathers for “injecting soul” into the Indian Constitution by using such images. There are several such videos, available online, where Prasad can be seen flaunting his ear-marked copy with numerous sticky notes at public events. And the act always steals the show.